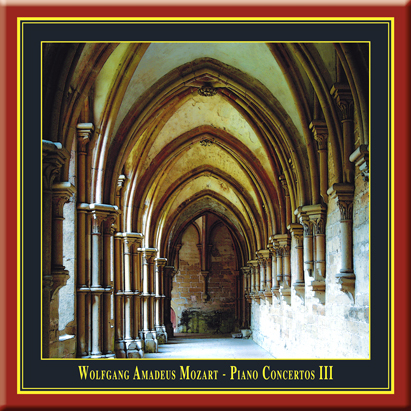 fter releasing the concertos for piano and orchestra in G major KV 453 and A major KV 488 (CD-No: KuK 77) and the piano concertos in C major KV 467 and D major KV 537 (CD-No: KuK 86), we now present a live recording of two more piano concertos by Wolfgang Amadeus Mozart, composed during his period as a freelance artist in Vienna. Freed from the chains of the archbishop, the most definitive instrumental works originated during this period from 1782 up to his death in 1791. Mozart composed the concerto in D major KV 451 in the early part of 1784. The premiere occurred at the Burgtheater Vienna on 1st April, 1784. Among other things, the work is characterized by a comparatively large orchestra, especially in the first movement - certainly the largest he ever used in a solo concerto. Mozart dated his piano concerto in D minor KV 466, 10th February, 1785. His father, Leopold, who was staying in Vienna at the time, reported after the premiere: "The concerto was incomparable... the orchestration splendid". The concerto KV 466 quickly advanced to being one of Mozart's most played concertos; the young Beethoven performed and wrote cadences for it, as did Clara Schumann. Here we have a recording by the pianist, Cristina Marton. A young and sensitive artist, born in 1974 in Temeswar in Romania, she has been decorated with numerous honours in international competitions, such as the Clara Schumann Competition, Düsseldorf; the Mozart Competition, Salzburg; and the Martha Argerich Competition, Buenos Aires. During her career, she has enthusiastically worked with such artists as András Schiff, Radu Lupu and Alfred Brendel. he varied repertoire of the Wuerttemberg Chamber Orchestra Heilbronn, documented by more than 500 recorded works, and numerous international tours with such important soloists as Anne-Sophie Mutter, Maurice André, Heinz Holliger, Gidon Kremer, Alfred Brendel, Hilary Hahn and Thomas Quasthoff, bear witness to the high standing of this ensemble and underlines its role as an ambassador for the cultural life of Baden-Wuerttemberg. Furthering the development of young performers is also an essential component of its artistic work. Ruben Gazarian, the successor to the orchestras founder, Jörg Faerber, can look back on a successful career as a violinist, concert-master and conductor with numerous orchestras and chamber orchestras in Eastern Europe and Germany. Directly before starting his work in Heilbronn, he received, in Frankfurt, the international "Sir George Solti" conductor prize.